Ancestors of my parents were church vergers, but my parents, who were born in the Soviet period, stayed away from church and religion. After their civil wedding on January 19, 1969, they went accompanied by friends and relatives, like many other newly married couples, to the historical holy town of Mtskheta, which is situated near Tbilisi, Georgia. In Mtskheta they visited Svetitskhoveli, the main Georgian Orthodox Cathedral, known as the burial site of Christ's mantle. The priest of the church was glad to see these young people and to their surprise offered to carry out the religious ceremony of marriage. Unexpectedly the happiness of marriage for my father and mother was lighted up by God. Later they found out that for Orthodox Christians January 19 is the day of Christ’s Epiphany (not 6 January as in the West). Over the decades, communist realities battled against religious beliefs and activities. In the post-communistic era the interest in religious art has increased. The issues of the nature of Christian art, the ways of portrayal, and the direction of future developments have become much debated. Ivana Demchuk is Ukrainian. The modern history of Ukraine is similar to the history of my homeland, Georgia, for many reasons: on the one hand there is the difficulty of overcoming the Soviet mentality, the war and loss of territories and on the other hand there is a need for change and a new national vision. Ivana was born in the post-soviet epoch and represents a new generation of painters for whom religious themes are free to access. Epiphany – manifestation, striking appearance – commemorates the baptism of Jesus in the Jordan River, which is seen as his manifestation as the Son of God. According to tradition this was one of the only two occasions that all three Persons of the Trinity manifested themselves simultaneously to humanity. God the Father by speaking through the clouds, God the Son by being baptized in the river, and God the Holy Spirit in the shape of a dove descending from heaven (the other occasion was the Transfiguration on Mount Tabor). Thus the holy day is considered to be a Trinitarian feast. Ivana’s Epiphany is small in size (30 x 40 cm). Painted in mixed techniques the picture makes use of only a few colours: white, black and brown-red. We can see four figures: in the left upper corner John the Baptist; below him Jesus, and in the right lower corner two angels. Dressed in white John the Baptist and the angels bend down towards Jesus. John is baptizing Jesus who stands with half of his body in the water. The angels do not look directly at Jesus, but their poses are full of adoration. Jesus is depicted vertically standing in the river, above his head a semicircle symbolizing God the Father. From the semicircle a beam comes down, which ends in a circle with a white dove – symbol of the Holy Spirit. Red-brown nimbuses surround the heads of all four personages. 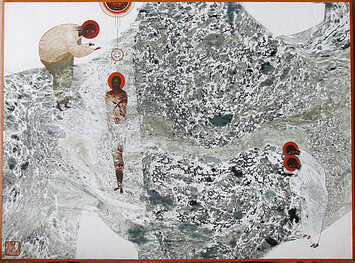 At first glance everything in this painting seems recognizable and decided by traditional Orthodox custom, such as the composition and the two-dimensional style. Yet the work is somehow unusual. There is white sky in the background, white pieces of ground, a semi-white river, and a large black and white section which looks like a rocky structure or the waves of the water. It is difficult to understand where the action is taking place. Is this earth or is it heaven? The bodies dressed in white have an immaterial character. The body of Jesus is semi-visible in the water. The black and white section seems to be an element that has absorbed glory and love from the miracle event and is saturated by the Trinity. It is streaming out of the painting to dignify humanity, family, country, the world. My parents celebrated 47 years of marriage this year . . .
Ivana Demchuk: Epiphany, mixed techniques on canvas, 30 x 40 cm. Ivana Demchuk was born in 1990. She graduated from I. Trush’s State Art College in 2008. She got Bachelor’s and Master’s degree at the Lviv National Academy of Arts (Faculty of fine arts and restoration, The chair of Sacral Art). Since 2008 she is participating in exhibitions in Ukraine and Poland.